When Dr. Kathryn Ko is not operating on a brain, she is painting one. As a surgeon and a painter, Dr. Ko specializes in the anatomy of the brain and cranium. Her art — whether realistic pieces or the more abstract and conceptual works — springs directly from her 30 years of emergency surgery experience in hospitals in New York City. When a classical trumpeter from a Russian orchestra took a bad fall during a performance in New York in 2010, Dr. Ko performed emergency surgery at St. Barnabas Hospital in the Bronx, helping to preserve both his life and his playing career. Afterward, she painted his portrait,complete with the scar across his scalp. 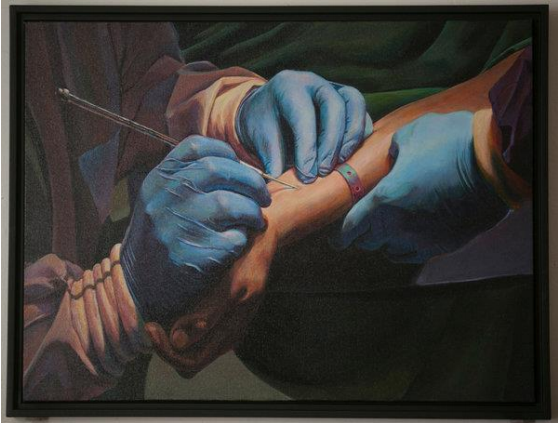 As Precise With a Paintbrush As She Is With a Scalpel By COREY KILGANNON, The NEW YORK TIMES, DEC. 11, 2014 Dr. Kathryn Ko, a neurosurgeon at Kings County Hospital Center in Brooklyn, has made paintings that show her operating alongside her surgical team and has created a homage to a favorite pneumatic cranial drill. Credit Dave Sanders for The New York Times When Dr. Kathryn Ko is not operating on a brain, she is painting one. “It’s the most beautiful thing on earth, hands down,” said Dr. Ko, 59, a neurosurgeon at Kings County Hospital Center in Brooklyn. “The power, the meaning. It’s what we are. And I get to see it alive.” As a surgeon and a painter, Dr. Ko specializes in the anatomy of the brain and cranium. Her art — whether realistic pieces or the more abstract and conceptual works — springs directly from her 30 years of emergency surgery experience in hospitals in New York City. When a classical trumpeter from a Russian orchestra took a bad fall during a performance in New York in 2010, Dr. Ko performed emergency surgery at St. Barnabas Hospital in the Bronx, helping to preserve both his life and his playing career. Afterward, she painted his portrait,complete with the scar across his scalp. And when she was called to a city morgue to examine the skull of an unidentified man found in the Bronx, she wound up painting it. She has made paintings that show her operating alongside her surgical team and has created a homage to a favorite pneumatic cranial drill. Dr. Ko, who has an acute ear for musical pitch, had noticed that the drill emitted a G sharp when rotating at the proper operating speed. She made a painting of her using the drill and named it “Craniotomy in G Sharp.” Dr. Ko holding a rendering of a human brain executed on plastic packing material over a portrait she painted of a woman close to death titled "Go Gentle." Credit Dave Sanders for The New York Times “It’s kind of like my career memory books, to freeze the moment for me,” Dr. Ko, who has a master’s degree in painting from an online university, said of her neurosurgical-inspired art. “I’m trying to represent something that hardly anyone sees, except brain surgeons.” Dr. Ko performs emergency brain and spinal surgery on patients taken to the Kings County emergency room, one of the city’s busiest. 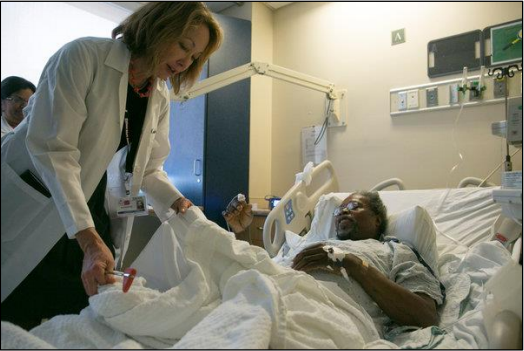 Her patients include victims of gunshot wounds, car accidents, strokes and tumors. She often works on call and paints at studios around the city,always keeping her car close by, for urgent responses. 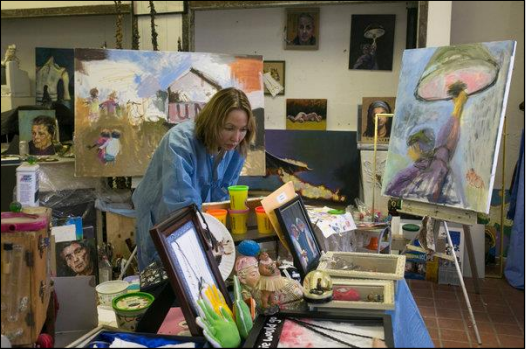 “I wish I could be an artist in residence at a hospital, and when there is an emergency, I just put the brush down and go into the O.R.,” she said with a laugh. Parallels between her two pursuits were on display one recent morning in the Kings County neurosurgery office, as Dr. Ko surveyed a scan of a patient’s brain and then pointed to two of her paintings of colorful images based on such scans. Another piece, a print of a brain, hung on her office door near an “Eddie Would Go” bumper sticker, a reference to the Hawaiian surfer Eddie Aikau, who was lost at sea in 1978 while trying to rescue occupants of a canoe that had capsized. Dr. Ko, who grew up in Oahu, Hawaii, said she had paddled Hawaiian canoes with Mr. Aikau’s family before moving to New York in 1983 to begin her surgical career. Dr. Ko said that Mr. Aikau had been an inspirational figure to her when she was a young surgeon traveling through the city’s rough neighborhoods to do night shifts at different hospitals. Even before she took up painting 10 years ago as a creative outlet, Dr. Ko said, surgery had kindled her appreciation of the brain’s visual beauty — the way its image reflects off a scalpel’s shiny surface, the glistening landscape of its various lobes. Reprinted from – December, 12, 2014 – Pages A-26,28.